OLD PARKED CARS. 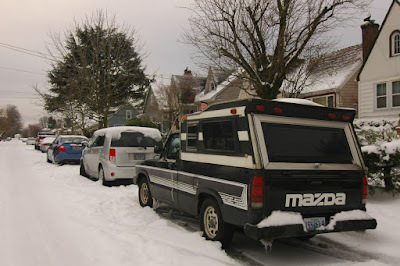 : 1984 Mazda B2000 SE-5. Believe it or not these were pretty popular pickup trucks. I believe a lot of people had them in the the mid 80s. Now on to other things, with the cab on the truck (second) picture it does look good. I think on the angle of the third picture the truck would look better with the cab off it. 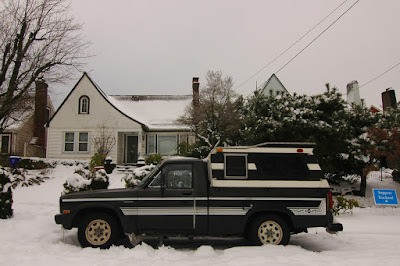 Speaking of the third picture it looks really good with the snow and that old house white house in back of the black Mazda pickup with those white pinstripes. 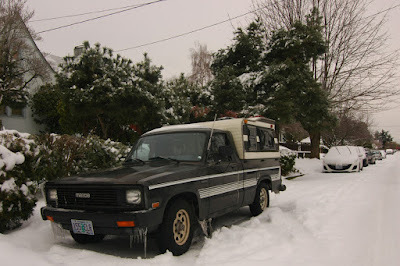 Last thing I observed about these photographs is the snow. I noticed it wasn't snowing at this point but yet the street is still not paved. I am use to snow here on the East Coast that's why I was surprised the street wasn't paved yet. Does it bother anyone else that minitrucks like these aren't made anymore? Nowadays just about every landscaper seems to be driving super-duty Fords. Surely not trying to compensate for anything. despite the crazy snowstorms killing the east coast, it's hardly dipped below 40 degrees this season in portland, so these photos are at least a year old. i think richard typed the word "paved" when he meant to say "plowed." yeah, portland doesn't put much effort into plowing neighborhood streets. people usually just stay home for a day and wait for the thaw. i photographed this charming little rig last summer, i think, but the light was too harsh, and my shots didn't come out. i remember how much i dug that house in the background, but i think that bush was casting a wicked shadow. 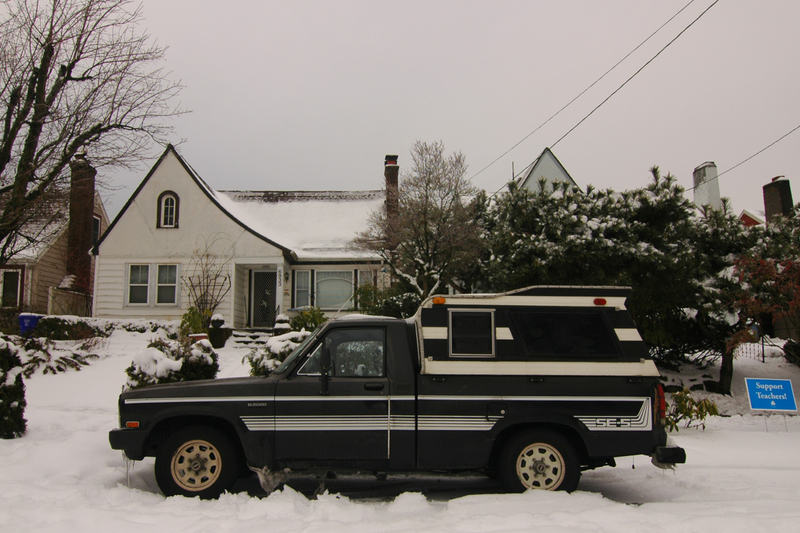 i assume you had to photoshop this to get that texture into the snow while preserving the black truck. nicely done. nice exposure.